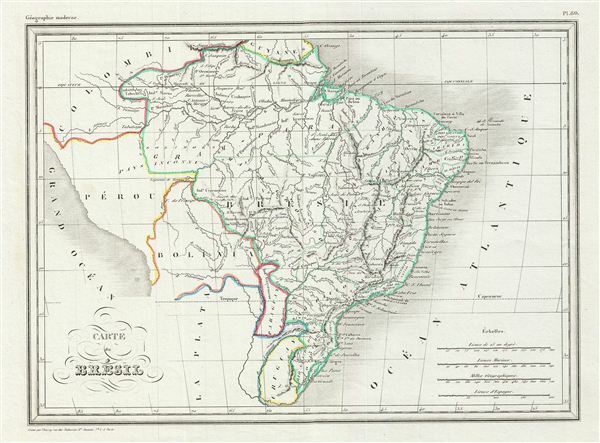 This is a fine example of Conrad Malte-Brun's 1843 map of Brazil. It covers all of modern day Brazil from Guyana and Colombia in the north to Uruguay in the south and from Bolivia in the west to the Atlantic. Much of South America was, at this time, embroiled in or about to become embroiled in, severe civil strife. The new nations, freed from Spanish and Portuguese dominance though various wars of liberation in the previous decades, were struggling with their newfound independence in an attempt create stable and prosperous governments. Various cities, towns, rivers and other topographical details are marked, with relief shown by hachure. Boundaries are color coded according to regions and territories. This map was issued as plate no. 80 in Conrad Malte-Brun's 1843 Precis de la Geographie Universelle. Malte-Brun, Precis de la Geographie Universelle, ou Description de Toutes les Parties du Monde sur un Plan Nouveau, d'après les Grandes Divisions Naturelles du Globe, (Paris) 1843. Very good. Wide clean margins. Blank on verso.